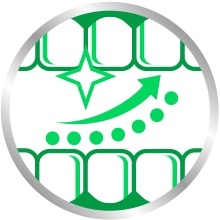 Why clean your denture with Polident Cleanser instead of toothpaste? While dentures are replacements for natural teeth, they are also about 10x softer. This means they can be vulnerable to scratches caused by abrasives found in regular toothpaste - leaving gaps for bacteria to grow in. Pretty soon, you could be dealing with bad breath caused by unhygienic dentures or other cleaning methods. 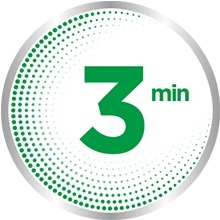 Polident 3 Minute Daily Cleanser kills 99.9% of odour-causing bacteria in just 3 minutes, and other micro-organisms in 5 minutes*. Eat, speak and smile with confidence! Drop one tablet in very warm (but not hot) water. Ensure your dentures are completely submerged. Leave to soak for 3 minutes, or overnight if you prefer. Brush the dentures with the solution using a soft bristle toothbrush. 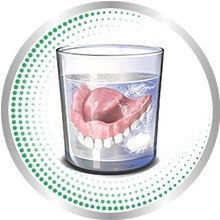 Rinse your dentures with water and discard the remaining solution. Polident 4 in 1 Cleaning System is the answer. For added confidence and comfort use Polident Denture Adhesive every day. Dentures are not like natural teeth, that's why they need daily special care. Polident "4 in 1" cleaning system contains 4 cleaning agents that act together helping to keep your denture as clean as possible. Have you ever tried Polident Denture Adhesive? It holds your dentures securely all day, and helps keep out irritating food particles. Use Polident Cleanser and Polident Denture Adhesive daily for a carefree denture wearing experience. Suitable For: Suitable for dentures. Do not place tablet or solution in mouth. - Keep tablets out of reach of children & those who are at risk of accidentally swallowing the tablet or solution. - Do not touch mouth or eyes after handling tablets or solution. 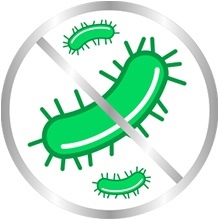 Wash hands thoroughly after handling tablet or solution. Dental hygiene is an important part of good oral health. Use Polident for every day confidence. Do not use: if you are sensitive to any of the ingredients. If in eyes: Rinse cautiously with water for several minutes. Remove contact lenses, if present and easy to do. Continue rinsing. If eye irritation persists: Get medical advice/attention. Harmful if swallowed. If swallowed: Call the Poisons Information Centre. Australia: 13 11 26; New Zealand: 0800 764 766 or doctor/physician. May produce allergic reaction. May produce allergic reaction. If irritation occurs: Discontinue use and get medical advice/attention. Sodium Bicarbonate, Citric Acid, Potassium Monopersulfate, Sodium Carbonate, Sodium Carbonate Peroxide, TAED, Sodium Benzoate, PEG-180, Sodium Lauryl Sulfoacetate, PVP/VA Copolymer, Flavour, Cellulose Gum, CI 42090, CI 73015, CI 19140. 1. 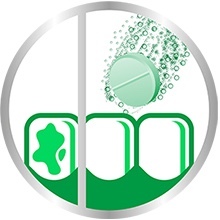 Drop one Polident Cleanser tablet into enough very warm (not hot) water to cover denture. 2. 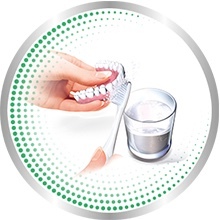 After soaking for 3 minutes, or overnight if you prefer, brush denture with the solution using a soft denture brush. 3. 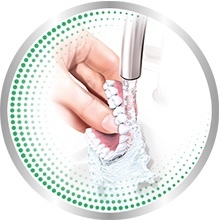 Rinse denture thoroughly with running water. Discard solution immediately after use. Keep the tablets in a cool, dry place. 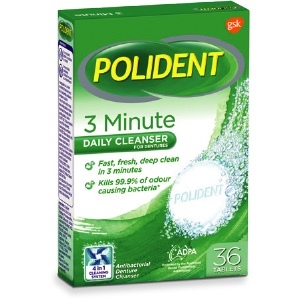 Polident Denture Cleanser Fresh Active Tablets 36 is rated 4.7 out of 5 by 3. Rated 5 out of 5 by naturegirl from Quick and Fresh I bought this product online and wouldn't look anywhere else for a truley fast and efficient cleanse. When in the shower, my partials soak. 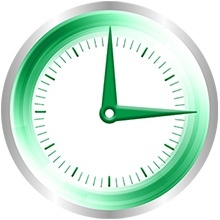 The product is quick to use and no messy measuring - just open the little package pop in water - 3 mins later done. Fantastic.